Wipe the tile clean with a damp cloth. Colour the tile with the Sharpies with bold and contrasting colours. Don't worry if it's messy, if the colours overlap or if there's white space showing. 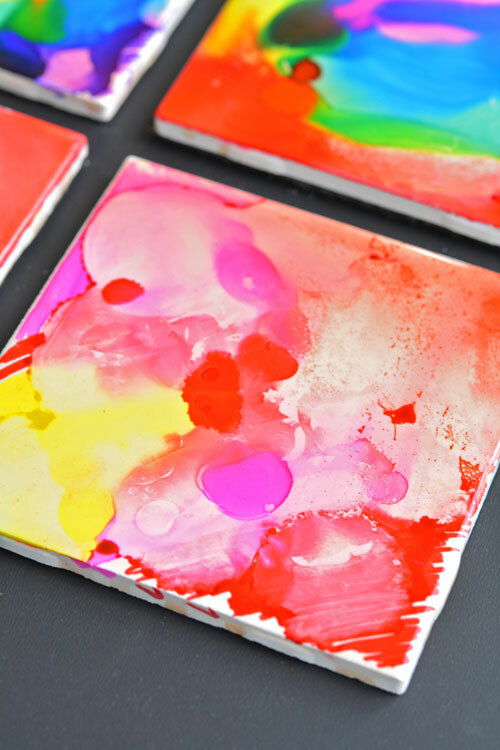 Using an eye dropper, carefully drop the rubbing alcohol onto the coloured tile. Allow the tile to dry for at least 40 minutes. Using a small paintbrush, gently cover the top of the tile with a polyurethane top coat to seal in the colour. Allow to set for 24 hours. Cut the felt to the size of the tile, peel off the backing, and stick it to the bottom of the tile.